Our space to be creative and make wonderful things. 1700sq feet of technical heaven! Photo and video pantograph lighting, large Green/Blue screen, cyclorama lighting, 9.6m long x 4.8m wide x 3.7m high white infinity cove, roomsets, kitchen, dressing/make-up room, free Fibre Wi-Fi and lots of clever kit. Ample free customer parking, large roller shutter door access ... and most importantly coffee, tea and biscuits! Our studio is equipped with all sorts of things to make your photography or video shoot run smoothly. Starting from the outside, we have ample free customer parking and 3m wide x 4m high roller shutter door access, this leads into our initial product storage area, which is 4m x 3m. We have a large 9.6m long x 4.8m wide x 3.7m high infinity cove, this can be painted to any colour you wish. As you can see from the picture, at the moment it is mostly painted white, with a 3m section painted in specialist VFX Chroma Blue paint. The roomset area is 5.5m x 5.1m with walls 3.3m high. It has 3 different style rear-illuminated windows, a door and two recessed walls. Again, the roomset can be decorated to your taste to create the perfect room for your shoot. The studio is sound treated to reduce flutter echos to a minimum, so whatever we’re recording you can be sure voices will be clean, clear & professionally recorded to broadcast quality. For our video productions in the studio we use the latest remote controlled, digital, cold-running LED flicker-free lighting, which has a high colour-rendering index. 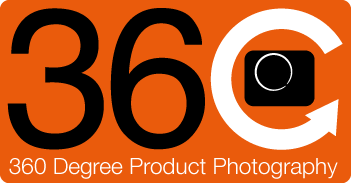 For photography we prefer to use our high powered digital strobe flash light units. 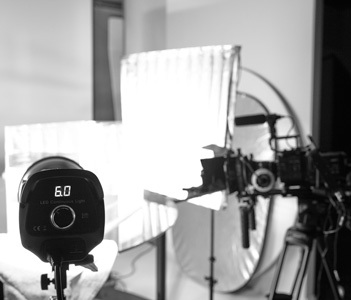 For both our video & photography lighting we have various light modifiers; a variety of soft box sizes, including large 1.8m long soft boxes, beauty dish, snoots, honeycombs, octobox. 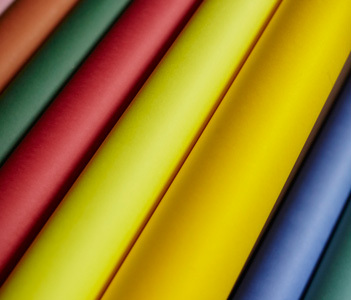 We also have an extensive selection of coloured paper rolls. We always make sure your products look their best and when shooting with fabrics we have a garment steamer and iron available. 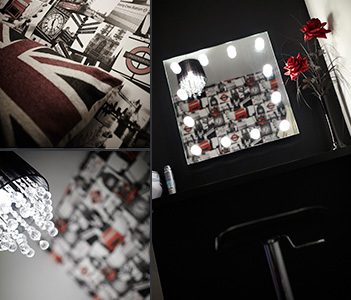 For any models or presenters coming to the studio we have a private London themed dressing/make-up room with illuminated make-up mirror & full length illuminated mirror. If 360 rotating images are what you’re looking for, we have everything you need with our bespoke rotating centreless turntable and at 1.8m diameter is, to our knowledge, the largest in the UK. You can choose to be present at the studio while we photograph or film, or maybe you are a photographer or videographer in need of a creative space.